**This listing is for the preorder of the book, which will be released in January 2018. All preorders will be shipped as soon as the book is here. An Altar In Your Heart is a beautiful introduction to a prayer method that spans centuries from the 6th century to today’s high-tech world. The Jesus Prayer is prayed by people from all walks of life. Read and learn about the ancient prayer that is “rooted and grounded in the Incarnation”. 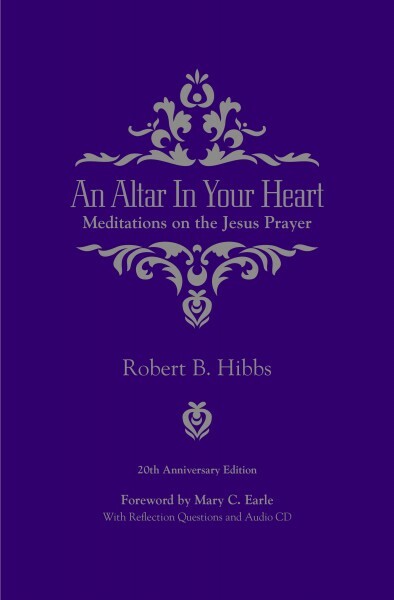 This series of meditations by Bishop Robert B. Hibbs arises from a lifetime of study and daily use. He has the distinction of expressing profound insights in an everyday way. Bob Hibbs’ book will build understanding as to why a prayer so simple, The Jesus Prayer, is used daily by millions of people all around the world. SKU: 978-0-9967535-9-3. Category: Books. Tags: Altar, Altar In Your Heart, Hibbs, Jesus, Jesus Prayer, Mary Earle, Material Media.